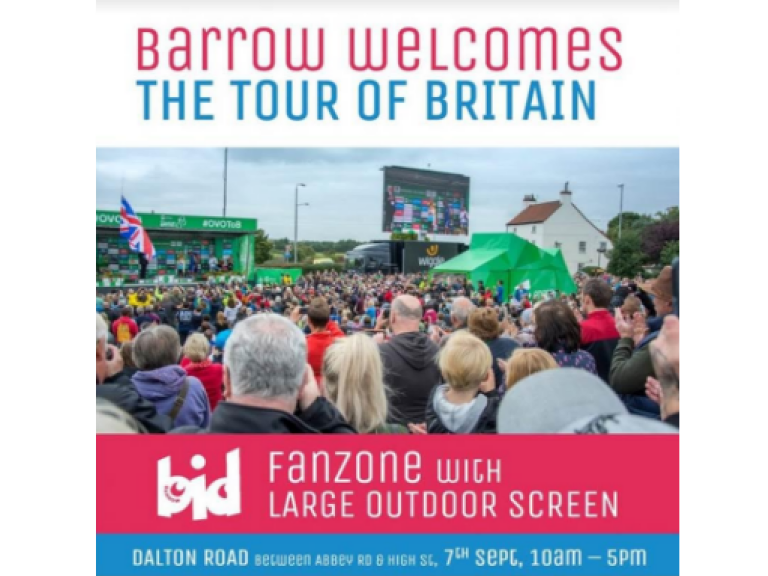 Don’t miss Barrow’s OVO Energy Tour of Britain Fanzone!! The Barrow to Whinlatter stage will be screened live on ITV4, but rather than stay at home and watch, why not come into the town centre and make a wheely good day of it? Barrow BID are making sure that Friday 7th September promises to be a day to remember for local residents and race fans alike. There will be a large outdoor screen in the fanzone (which will be opened by the Chairman of Sweetspot – organisers of the Tour of Britain) located at the bottom of Dalton Road between Abbey Road and High Street where you’ll be able to watch the full stage. Free face painting for children. One vs One static bike racing by DW Fitness. Free water –supplied by DW Fitness. A static bike challenge, hosted by Life Leisure. And don’t worry about going hungry either. Throughout the day you can make the most of delicious street food offers from Dhaba Indian Restaurant, as well as enjoying food and drink offers from a host of local pubs and cafes in the area. So make sure you ‘get on your bike’ and head over to Barrow Town centre on Friday 7th September for a day you won’t forget.